WRITING UPDATES: I’ve been working hard on the first book in my new paranormal thriller series. It’s going great! I’m due to turn in the finished manuscript to my agent at the end of June. Edits will follow. By the fall, I hope to be starting on The Solstice Countdown — the next SPI Files book where Mac takes Rake home to meet the family! And for the Raine Benares fans, yes I will be doing another Raine book from her POV set in her world. The plan is to write that after The Solstice Countdown. All that will keep me out of trouble until this time next year. READ FOR PIXELS FUNDRAISER: This year, I’m participating in The Pixel Project, a completely virtual, volunteer-led global 501(c)3 non-profit organisation whose mission is to raise awareness, funds and volunteer power for the cause to end violence against women using the power of the internet, social media, new technologies and popular culture/the arts. I’ve joined other award-winning, bestselling women authors in donating exclusive goodies to a RallyUp fundraiser to develop and expand The Pixel Project’s campaigns, programs, and projects to end violence against women and girls. The prize packages (called “perks”) are available on a first-come, first-served basis. Go to this page to learn how you can donate and get a perk from one of your favorite authors. Scroll down the page to get to my three perks which were posted this morning. They include a Raine Benares bundle and have me name a character after you in my next book! (The SPI Files bundle has already been snatched up. Sorry!) All bundles include a custom crocheted slouchy beanie hat. (I’m seriously into crocheting now. It helps me work my way through plot problems.) The “character name” perk includes a scarf and matching beanie for the donor. In addition, today I have an interview on The Pixel Project’s blog. A brand new series & Happy Thanksgiving! Thank you so much for all the emails, comments, and reviews for The Phoenix Illusion! I’m so glad you’re enjoying it! If you have time (and are so inclined), I’d love for you to leave a review on Amazon or the retail site of your choice. It really helps spread the word about my books. I wanted to pop in before Thanksgiving (here in the US), and before the rush of the holidays gets into full swing, to let you know what I’m working on now. It’s a new series that’s a little bit of a stretch for me. It still qualifies as urban fantasy, but with a paranormal thriller twist. The series is called Operation Paranormal, and the first book is The Entity Game. More details to come. I know everyone’s about to get seriously busy, so I may not send out another newsletter until after the first of the year. I just wanted to thank you all so much for the awesome reception you’ve given The Phoenix Illusion, and to tell you about my shiny new idea. Happy Thanksgiving, Merry Christmas, and the happiest of holidays! Love & hugs to you all! Finally — The Phoenix Illusion is out and available now! It’s here — about danged time, right? *My apologies about the 3-day ebook delay at B&N, Apple and Kobo. It was the quickest release date available. The Phoenix Illusion has started appearing for pre-order at various retailers ahead of its November 6 (next Tuesday) release. I’ll update this post as more sites go live. *My apologies about the 3-day delay at B&N, Apple and Kobo. It was the quickest release date available. The Phoenix Illusion ebook is available for pre-order at Amazon! I’ve uploaded the finished/final manuscript and cover art to the various distributors. The Kindle ebook version of The Phoenix Illusion is the first to go live for pre-orders. Here’s the link. I’ll post as the other links/versions go live. Snippet from The Phoenix Illusion & only 1 WEEK until pub date! Only one more week to wait! Next Tuesday, November 6, is Election Day here in the US (please vote! 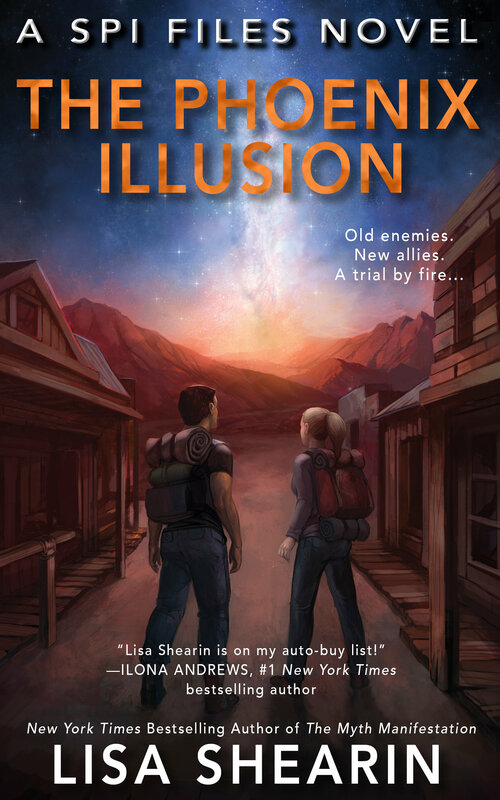 ), and release day for The Phoenix Illusion. We’ll be finalizing the formatting for the last ebook version in the next day or two, and then I’ll be uploading everything to the distributors I use for print and ebooks. Audible will be releasing the audio version on Nov. 6 as well. AS SOON AS, I have preorder/sales links, I’ll post them here. OR if you want the links sent directly to your inbox, sign up for my newsletter (see link in the right nav bar). The helicopter waiting for us was large, black, and unless my sleep-deprived eyes deceived me, came complete with machine guns mounted on either side. Cool. That is, unless Mr. Moreau thought we’d be needing them. He didn’t elaborate further, and to tell you the truth, the only thing I wanted to know about SPI and black helicopters was could I catch a few winks over the engine noise. We got in and took off, and as far as I was concerned, we were flying way too low. It was pretty much all desert below us, but I still thought we were entirely too close to it. “How long did it take to get there?” I asked. Ben gave a low, impressed whistle. Flying all night. In the open air. I couldn’t even begin to imagine. Nor did I want to. “A Black Hawk can breathe Hellfire missiles,” Ian told him. Two weeks until The Phoenix Illusion (November 6) is available in print, ebook, and Audible! I’ve gotten questions about why it’s not available for pre-order yet. My book designer was on vacation for three weeks, and she just got back. I proofed and approved the print version this weekend, and I’ll be doing the same to the ebook versions in the next day or so. The cover art is ready to go. See below for the awesome cover Julie Dillon created for me! Long story short, I’ll be submitting the book files and cover to my various distributors hopefully by the end of this week. Then it’s in their hands as to how fast they get it up for pre-orders. Hopefully it won’t take long. Rest assured, as soon as they go live, I’ll send out another newsletter with all the links. Y’all will hear about it here first. Here’s today’s snippet. . .and under that is Julie’s glorious cover! I kept regular daylight office hours at SPI. Usually. Unless something big was going down, then I went until I couldn’t go any more. The forces of evil didn’t clock in and out, so neither could I. My problem was that when I was borderline exhausted, more often than not, exhaustion brought along her good friend insomnia. In addition, my subconscious had brought paranoia, fear, and inadequacy to the sleepover. I did meditative breathing. No go. I tried counting sheep, but just as I was starting to doze off, the fluffy little sheep turned into zombie sheep and attacked me. “Are pets allowed?” I whispered to Rake. Werewolves had great hearing, too. Right now, Yasha and Kitty were relaxing in the hot tub out on the terrace to try to take the edge off Yasha’s werewolf urges. The tub was surrounded by what the hotel’s website called the Zen Garden. Since it was completely private, Yasha was letting his hair down, so to speak, for as long as he could before he had to bottle it up with a glamour for tonight. He was pretty much still in his human form, but jeez, was he furry. Kitty had just skimmed a handful of hair the length of Christmas tinsel off the top of the water. “He is like a sasquatch,” Ben said in awe. A little less than a month until The Phoenix Illusion is out! I can’t wait for you guys to read this one. There are twists, turns, and surprises — but most of all, there’s tons of fun and laughs. We can all use fun- and laugh-filled time away from the real world right now, and I can promise that The Phoenix Illusion will deliver. And while I didn’t plan it this way, the release date is Tuesday, November 6 — Election Day here in the US. 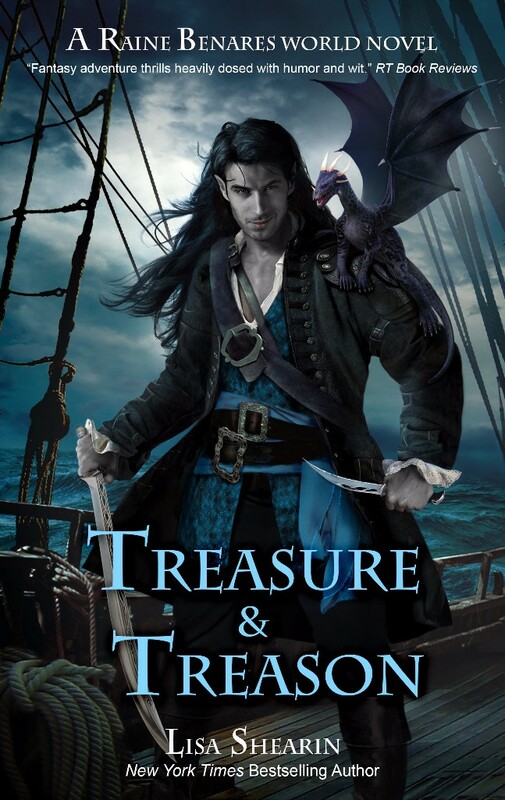 For those of you who haven’t read my Raine Benares series, and aren’t familiar with Rake’s cousin Tamnais (Tam) Nathrach, here’s the cover from Treasure & Treason. In The Phoenix Illusion, people keep mistaking them for twins. Here’s the snippet. Hope you enjoy it! I sensed her before I saw her. A mage of the darkest variety. Griselda Ingeborg was at the baccarat table. Her white beaded gown was slit up to there and had a neckline that nearly plunged down far enough to meet it. Her blond hair was piled high and sparkled here and there with jeweled pins. She wore diamonds. Lots of diamonds. The men in the immediate vicinity were captivated by the ones that fell between her ample breasts. That was what everyone saw. My seer vision saw a black haze that shifted with her every movement, like fog. It was the aura of a mage who regularly engaged in the blackest of magic, so much so that it left a permanent imprint on her. Then I saw what Ben had seen. It may not have been the most intriguing in terms of bodily placement, but it was what we were looking for. Griselda was wearing a Sythsaurian teleportation cuff. Naturally, it was encrusted with diamonds, so many that the green crystal in the center was barely noticeable. Tam was slicing through the crowd with the ease of a wolf carving a path through a flock of sheep, his primal instinct focused on one blond sheep. People got out of his way. Tam had some seriously potent come-hither, and that he was wearing his hair loose like a sheet of midnight silk only intensified it. Heads turned, breaths quickened, and a couple of drinks were dropped. Griselda looked up and I swear I saw her pupils dilate from where we were. Rake had done it to me before. I knew how my body had reacted. If Griselda was female and breathing, she was on the receiving end of much the same effect. As promised, here are the first three chapters of The Phoenix Illusion (SPI FIles 6). It’ll be out in one month (November 6) in print, ebook, and audio. As I said in my last newsletter, there may not be pre-order available on this one (my book designer is on vacation for another two weeks. Sorry.) However, you will be able to get The Phoenix Illusion on November 6. It was the third night in a row of strobe-like lightning with no thunder and no rain. That should have tipped me off—it should have tipped us all off—but it didn’t. I’d been having too much fun lately. Not that I didn’t deserve it. I did. Deserved it, needed it, wanted it, and welcomed it and its bearer with open arms. Besides, it was my birthday. Who didn’t deserve to have fun on their birthday? We were down the street from SPI headquarters at the Full Moon. The neighborhood bar and grill was our favorite hangout, so I’d picked it for my party. I hate surprises. As a kid, it didn’t matter how good my family thought they were at hiding surprises from me, I knew one was coming and I didn’t like it. Even if a person I trusted told me I’d love it. I might like—or even love—what the surprise was, but I hated what it did. To me. I was one of those people who got a side order of anxiety to go with any kind of surprise. Maybe it all went back to me being a control freak—and a terrible liar. What if I got a present and I didn’t like it? When I was little, I had an aunt who made dresses for me. Let’s just say she had a thing for pink bows—a lot of pink bows. Big ones. It almost made me want to stop having birthday parties. Nothing was worse than unwrapping a present and not being able to fake a thrilled response. I didn’t want to hurt anyone’s feelings. It wasn’t that I didn’t like getting presents. I did. It was simply better for everyone concerned that I knew what it was beforehand. My name is Makenna Fraser and I work for SPI (Supernatural Protection and Investigations). In my professional life, I have a skill that eliminates a certain kind of surprise. I’m a seer. I can see through any shield, ward, or spell a supernatural being can use to disguise itself from the human population. My ability also applies to cloaks and veils that render their wearers invisible. SPI is in the supernatural criminal apprehension business. You can’t apprehend what you can’t see. That’s where I come in. I go with our agents or commando teams and point out the supernatural perps they can’t see, so they can take them down or out. That wasn’t to say my professional life wasn’t chock-full of surprises. It was. The kind only someone named Rambo would enjoy, but at least I didn’t have to act happy to see them. In fact, most times it was perfectly acceptable for me to shoot it full of lead or—on occasion—silver. Or better yet, get out of the way so our commandos could do the same. As much as I wanted to be as badass as my coworkers, I’d come to accept that it simply wasn’t gonna happen, but that didn’t stop me from training and trying. It was the least I could do for the people who had to work with me. I was from the mountains of North Carolina, a proud Southern girl, and was determined to stay that way, even though I now worked and lived in New York. I loved my adopted home and would—and had—put my life on the line to defend it and its people, but I’d always consider Weird Sisters, North Carolina, home. Today in the office, I’d gotten a cake in the break room, and been on the receiving end of an embarrassing (to everyone concerned) rendition of “Happy Birthday.” The party at the Full Moon was a casual gathering of my closest friends/coworkers, with dinner and open bar. The owners were like a work mom and dad to us all, and they’d offered to close the bar for the night for us—and for them. It was the week before a full moon outside the Full Moon. Bill and Nancy Garrison were from my home state of North Carolina and offered a slice of Southern hospitality to New Yorkers. The Garrisons had embraced the hide-in-plain-sight credo of supernatural concealment. They billed the Full Moon as New York’s Official Werewolf Bar and had decorated it accordingly. Heck, there was even a little gift shop up front. It was a meat lover’s paradise where the steaks were rare, the barbecue tangy, and the iced tea had enough sugar in it to make a spoon stand on end. It also had the distinction of having one of the best collections of single malt scotches in the city, scotches that’d put even more hair on a werewolf’s chest. The coming of the monthly full moon made life awkward for the Garrisons and two of their staff who’d come with them from south of the Mason-Dixon line—their office manager and the head bartender. The rest of their employees were either supernatural beings or what SPI called clued-in humans (those who wouldn’t scream and run away at the sight of a furry and fanged boss). Going all furry and fierce once a month made it somewhat difficult to run a business, especially a restaurant. As the Full Moon’s barbecue pit master, Bill’s monthly inconvenience of increased hairiness presented a big problem with potential health code violations, not to mention the possibility of scorched fur. In another couple of days, Bill would hand the cooking honors over to his assistant and the human chef who ruled the roost in the kitchen. It’s a misconception that werewolves go stark raving loony during the full moon. They’re more irritable during their special time of the month, but they aren’t gonna go nuts and rip your throat out. Unless you give them a good reason, in which case, they’d be glad to oblige you. All of those in attendance were friends of mine who were also coworkers or people connected to work who knew what we did. My partner Ian and his girlfriend Kylie were here. Ian Byrne was SPI’s top agent, and Kylie O’Hara was the director of SPI’s Media Relations department. She lived for crisis management, and when you were an agency responsible for hiding the supernatural world from humans, you pretty much lived in crisis mode. To add an extra touch of irony, Kylie wasn’t human. She was a dryad. Ian was human. Mostly. Way back in his ancestry was an ancient Irish demigod, but he didn’t let that get in the way of being one of the guys. SPI, even more than the mortal world’s alphabet agencies, did work that you simply couldn’t talk about. Secrets must be kept for the safety of those concerned and for ongoing investigations. SPI was the same with one big difference—even if we could talk about what we saw at work, people would think we were nuts. SPI’s best allies were humans who were in on our world’s big secret and didn’t freak out. Monsters were real, supernatural beings existed alongside us, and magic was as much a fact as gravity. I was sure there were people who denied the existence of gravity, just like there were those who denied other scientifically and historically proven facts and events. Some people wouldn’t recognize the truth if it bit ’em and had ’em for breakfast. There was a whole world out there that humans didn’t see. Their next-door neighbors might be plain vanilla human, or they could be any number of supernatural beings with their more alarming physical features either disguised by magical spells, or with devices developed and worn for the purpose of keeping a supernatural from being identified as such by their kept-clueless neighbors and coworkers. Humans had an unfortunate tendency to go all torchy and pitchforky when they discovered inhumans anywhere in their immediate vicinity. That was SPI’s main mission: Keep the peace by keepin’ ’em clueless. My hometown was full of all kinds of supernaturals. And being a seer, I’d grown up seeing each and every one of them. For me, supernaturals were the norm rather than the exception, which was probably why I didn’t think twice about having a goblin as a boyfriend. My momma had warned me about bad boys. Rake Danescu was a very bad boy—in all the very best ways. Though to hear my family talk, my dad had been a bad boy. Like mother, like daughter? Moth to flame, and all that? Rake Danescu had gone from being an SPI person of interest to being an agency ally. He was now my person of interest and occupied the one and only spot on my most-wanted list. For the first time ever, I had myself a serious boyfriend. Though Rake was definitely a man, not a boy, but I had no problem with the semantics. Regardless of what the rest of the world wanted to call our relationship, it didn’t change what it was. He was mine, and I was his, and that arrangement suited me just fine. We were supposed to have taken a trip to North Carolina so Rake could meet my family, but work had gotten in the way. Most notably, Rake’s new job. He’d recently been appointed governor of the goblin colony here on Earth. It wasn’t a job he wanted, but with the corruptness of the previous governor and his henchmen, Rake knew he was needed. He cared about his people and took his new responsibility very seriously. We’d postponed the trip until the end of next month. Rake enjoyed being with my coworkers more than he did the upper-crusters at the events and parties he was expected to attend as one of New York’s wealthiest men—and as the new goblin colonial governor. He’d told me more than once that me being by his side was the only thing that made those events bearable. To tell you the truth, “uncomfortable” was the nicest way I could describe accompanying Rake to the goblin events. A more accurate description would be “mouse in a room full of sadistic cats.” Not that they necessarily wished me harm—at least not most of them—but I was a human. Goblins considered humans, as well as elves and every other supernatural race and species, to be far beneath them. Goblins were what my Grandma Fraser would call snooty. I think that was why Rake preferred my friends to his acquaintances. They knew who he was (a goblin spymaster), what he was (a badass dark mage), and how he was (inscrutable as all get-out), and they accepted all of it. At least they did now. That hadn’t always been the case. Rake had come a long way in their estimation. A lot of that had to do with him putting himself in the worst kind of danger to save them from the worst kind of death. He’d been right there on the front lines with them more than once. That kind of bravery and selflessness was remembered, appreciated, and rewarded with friendship. I knew that Rake appreciated it. In his line of work, there weren’t many people he could trust. As a result, Rake didn’t have that many friends, and even though he hadn’t come right out and said it, I could tell he was truly happy when he was around mine. Slowly but surely those defensive walls of his were coming down. Rake walked the talk and put his money where his mouth was, and all that. As a result, folks at SPI finally believed that he didn’t have an ulterior motive for any of it. Acceptance and trust of Rake was a relatively new thing for me, too. The night I’d met Rake had been my first day working for SPI. To get his way, Rake had never been opposed to throwing in a little seduction. Not that he wasn’t good at it. He was. Oh boy, was he ever. But I’d been warned about him, and my guard had been up. Mostly. Hey, I was only human, as most goblins were all too fond of reminding me. Maybe that was part of what had attracted Rake to me. Goblins played games. Heck, their games played games. With goblins you never knew what was real and what was just another way to get what they wanted. They were kind of like cats in that respect. I’d always been more of a dog person, but I had a soft spot for any cat that rubbed up against me. Rake had rubbed up against me. Mostly metaphorically, but on occasion literally. I’d finally come to believe that it was because he liked me, not because he wanted anything. Well, aside from the obvious. And I had to admit, all that rubbing felt oh so much better now without any clothes in the way. “What are you thinking?” Rake purred against my ear. We were snuggled in a booth watching our friends getting seriously competitive at an after-dinner game of darts. Rake was politely sitting this one out because he was entirely too good at throwing sharp, stabby things. Actually, so were my coworkers. The target’s bull’s-eye was getting a serious workout. Bill and Nancy were gonna have to replace the board after tonight. “Nothing,” I told him. It was the go-to answer when you got caught thinking something you didn’t want to admit—at least not in public, surrounded by your coworkers. “You were smiling.” Now so was he. “Well, if you’re sure.” His fangs darted in for a quick nip on my ear. He knew that made me crazy. But I knew what made him even crazier. Payback would be sweet. Later. Suddenly, a tingle that had nothing to do with Rake’s nibbling ran down my back. Rake had frozen, all his senses on high alert. In seconds, the pressure in the room increased to an excruciating level and immediately dropped. It was like the onset of the worst sinus headache ever. Then my ears popped. Painfully. Kenji Hayashi, half-elf and SPI’s IT and communications guru, quickly stuffed a napkin under his now bleeding nose. He wasn’t the only one. The pressure drop was followed by a boom from outside. Close-by outside. It wasn’t an explosion, at least not the kind caused by explosives. It was magic. The big kind. The kind that didn’t happen by accident. The bar area of the Full Moon was away from the restaurant’s front windows. It was so dark back here that I couldn’t see my hand in front of my face. The Garrisons had emergency lights, but apparently those weren’t working, either. I felt and heard Rake quickly slide out of the booth. “Everyone stay put.” His voice came from halfway to the front doors. “I’ll take a look.” As a goblin, Rake had some serious night vision. The Full Moon was warded. The Garrisons didn’t have defensive magic of their own, and most times they didn’t need it. Most times fur, fangs, and fury were all that were needed to deal with any incident. We considered the Full Moon as an extension of SPI HQ. As such, the Garrisons had allowed our battlemages to ward the bar with enough defensive magic to keep out anything SPI’s enemies could conjure up. And while the Garrisons didn’t have any magical skills, they had an ability the rest of us didn’t. A highly developed sense of smell. A fun night with friends had officially turned into unwanted business. Training and instinct took over. We weren’t the NYPD, so we couldn’t storm out the front doors with our guns drawn. Not to mention storming anywhere would’ve been stupid until we knew what we were dealing with. But now that we had light, we could go find out. A second boom shook the floor under our feet. Rake was standing on the sidewalk outside the front doors. He was staring down the street in shock. Ian, Kylie, and I joined him. Adrenaline was good for all kinds of things. It gave you time to figure out how not to die a horrible and messy death. It also gave you time to figure out just what the heck you were looking at, and how best to deal with it without dying said horrible and messy death. That being said, adrenaline was absolutely no help when it came to telling my mind what to do with what I was seeing. There was a vacant lot two buildings down from where we stood on the sidewalk—a lot that had been vacant when we’d walked to the Full Moon from work. A three-story building was smack dab in the middle of it and was fully engulfed. Sirens in the distance signaled that New York’s finest firefighters were on the way. The nearest station was only six blocks away, and I was no fire expert, but even I knew there wasn’t going to be anything left to save. The fire was burning too hot. Too hot for a normal fire. But the air wasn’t hot. It was downright cold. Cold enough to see my breath. The temperature had to have dropped at least forty degrees from the time we’d walked over from headquarters. The flames engulfing the structure were circling in on themselves toward the center of the structure like a tornado; and above the fire the sky glowed like a golden aurora borealis. The fire and the glowing sky were the only light in the immediate area. None of this was normal. Rake stared in shock and disbelief. “That’s my house,” he managed. Working for SPI, you saw some strange . . . stuff. This took the cake—and any ice cream that came with it. Regor was the goblin capital. Those of us who’d heard Rake say what the building was and where it’d come from were wearing variations of his disbelieving stare. I started to cough at the smoke in the air. Apparently, I’d also had my mouth hanging open. Rake’s dark eyes were intent and moving rapidly over the structure. I felt his magic reaching out, toward the engulfed house, scanning the interior. . .
Kenji had his phone out. Weirdness at this level needed to be called in, especially when said weirdness was happening mere blocks from our worldwide headquarters. Mine was in my purse, and I’d left that in the booth. Several of my coworkers had theirs in various pockets. All the screens were dark. Dead phones, no electricity, a funky glow in the sky, and a house from another world on fire. “Cendi, can you get through?” Kylie asked. Cendi Tremont was a seriously gifted telepath. She could she talk mind-to-mind to anyone in a fifty-mile radius. For SPI agents, if she knew you were in a meeting, she could telepathically send a text to your phone. And she was an absolute blast on our SPI girls’ nights out. Cendi stepped back into Full Moon’s doorway, bowed her head, and stood motionless for a few moments. She glanced back at us and gave a thumbs-up. At least something was working. “Ms. Sagadraco and Mr. Moreau,” Cendi said. SPI’s boss lady herself and her right-hand man now knew what was happening. Cendi didn’t play around. “I also own the empty lot,” Rake told us. Ian swore, Kylie added to it, and I couldn’t have agreed more with their word choices. A very large and public situation had just turned from a literal and metaphorical three-alarm fire into an impending catastrophe. Rake’s house from Rake’s world burning on Rake’s lot. Accident? Random celestial convergence? Nope and nope. The firemen and police might not know this wasn’t an accident, at least not yet, but we did. New York’s law enforcement community frowned on arson, regardless of the cause. We didn’t have much time before someone official started asking unanswerable questions. Like why there was a building burning on a vacant lot. The firefighters had responded to a report of a building on fire. They came, they saw a building burning. Their job was to make the building not burn anymore, not ask who put a building on a lot that had been vacant hours, or maybe minutes, before. They had one job—at least for now—and they were doing it. When the fire was out and cooled enough to get in there, they were gonna have a lot of questions. Police were moving onlookers closest to the blaze to a safe distance. There was an outer perimeter where a couple hundred people were straining to get a look at what would have been trending on local Twitter feeds by now, that is if anyone’s phones had been working. I scanned the crowd and was glad to see a lot of disappointed tweeters. At least something good was coming from the power outage. Nothing brought out rubberneckers like traffic accidents and fires. Used to be, folks would just stand there and watch. Now they whipped out their phones and started recording. Smartphones were SPI’s bane. In the old days, when someone said they saw a werewhatever, it was their word against a world that wondered where they’d stashed their tinfoil hat. Now, it was merely a matter of being in the right place at the right time. Contrary to what you might believe, there were very few supernaturals who couldn’t be photographed. That made our job infinitely more difficult. That didn’t even take into account what would happen if the supernatural who was being photographed or filmed was the human-eating variety. The result was usually the meal-to-be documenting their own deaths. SPI’s cleanup team scooped up a lot of phones in addition to hosing down sidewalks—all under a sight-obscuring cloaking spell, of course. I’d recently added portal detection to my skill set. Though a “set” indicated you had more than one to begin with. I didn’t. A portal was like a door you could walk through. In theory, distance didn’t matter. The house had come from another world, so unless houses on Rake’s world had legs, it hadn’t stepped through anything. I had no clue what had happened here. He was an elf. His ears were glamoured, but I could see the pointed tips. “Elf,” I told Rake quietly without moving my lips. There were non-SPI humans now sharing the sidewalk with us. The elven officer’s eyes widened when he spotted Rake. He recognized him even with the glamour that hid his goblin features. Probably every supernatural in the tristate area knew what Rake’s human guise looked like. Most of all, they knew who and what he was, and respected (and sometimes feared) both. Rake stepped forward and began speaking quickly to the elf, but careful to keep his voice down. Ian was right behind him. I stayed put. They were doing their thing; I was going to do mine. As a former NYPD homicide detective, Ian was still well known to those in the ranks. I couldn’t hear what they were saying to the elf cop, but I didn’t need to. I knew what Rake meant, and he knew what I was talking about. SPI had people in all levels of the NYPD, NYFD, and throughout the local government and beyond. They ran interference when supernatural events leaked out into the mortal world. Unfortunately, that happened more often than we would’ve liked. This wasn’t a little leak; it was a conflagration probably visible from the International Space Station. Getting a publicly acceptable story in place now would save SPI a lot of trouble later. I’d stayed put because I could do the most good scanning the crowd for what no one else would be able to see. I tried to look around without being obvious about it, which was easier said than done. In my opinion, someone wouldn’t pull a building in from another world, then torch it, without staying around to watch. Even if they didn’t need to be physically present to do whatever it was they’d done, they wouldn’t be able to resist being here to see their work properly appreciated. This was Rake’s house on Rake’s lot, within throwing distance of SPI HQ and our favorite watering hole. The house and location choice weren’t an accident or coincidence. It was personal, a smack in our collective face. Whoever was responsible for this was here. Watching the fire. I briefly closed my eyes to try to block out the ordered chaos of the scene from the police, firefighters, and onlookers, and focus on what was intended to be less obvious. Onlookers or even a firefighter or police officer who was watching us. When I slowly opened my eyes again, I saw I wasn’t the only one. I spotted several police officers scanning the crowd for anyone who was enjoying the blaze more than they should. Two of the officers were humans and the third a supernatural, another elf to be exact. Rake was speaking with a man who I assumed was the fire chief. Ian was with him, but seemed to be doing the same thing as me—scanning the crowd for suspicious-looking characters. My eyes were drawn up toward the night sky. Earlier, it had been cloudy with a funky kind of flashy lightning, almost like strobe lights. No rain had come of it. Now it was clear—at least of clouds. Light the color of flame still flowed in waves in the sky above the burning building. The closest comparison I could draw was northern lights, except these were gold rather than the usual green. Northern lights didn’t appear this far south; and if they did, they sure as heck wouldn’t be doing their thing in the small patch of sky directly above a burning building. I went back to scanning the crowd. Despite my seer skill, my actual eyes were only human. It was night, there was a building on fire, it was smoky, and there were enough flashing red and blue lights to induce the mother of all migraines, so it was next to impossible to see anyone acting suspiciously unless they were standing less than ten feet away. Since I wasn’t getting anywhere with my eyes, I opened my seer’s senses. Over the years, I’d developed a knack for knowing when magic was in use or had recently been used. I started over, scanning the crowd beginning with those standing closest to our SPI group and working my way around. Within seconds, I got my first clue that I was on to something: a rotten-egg stink. It was faint, but you couldn’t miss it. The firemen battling the blaze might think it was something burning inside the building, but this went a couple steps beyond sulfur. This was brimstone. I’d had an unpleasant up-close experience getting a snoot full of the stuff. Up close as in a trip to an anteroom of Hell. That stench was imprinted in my nasal passages forever. There had been a breeze when we’d walked from SPI to the Full Moon a couple of hours ago. Now there was wind. Yeah, a large fire made its own wind, but this was different. When you weren’t physically in Hell, a brimstone stink meant black magic had been recently worked. It didn’t necessarily mean demonic work, but it was definitely the hallmark of black magic. The stink that clung to the practitioner who had worked it was more of a slimy sensation that imprinted on the emotions rather than any of the five senses. Otherwise normal people who were psychically sensitive would be able to detect a black magic practitioner and be repulsed by them on a subconscious level, instinctively wanting to put as much distance between themselves and that person as possible. That precise sensation was coming from someone directly across from where we were standing, on the other side of the fire, and behind the barricades that mirrored our own. The source had positioned himself as close to the fire as he could get—and as far away as possible from me and my friends. “Yeah, that’s not a coincidence,” I murmured. “I may have just found our house-moving arsonist.” I kept my voice soft and my body still. I also tried to keep my thoughts neutral and quiet. To do anything else would be like sending up a psychic flare telling this guy exactly where I was. And yes, I could tell this practitioner was male. I tentatively reached out just a little more. He was also a goblin. A really angry goblin, as in a seething rage. It didn’t feel like a supernatural arsonist enjoying his work. That wasn’t a distinction I’d ever been able to make before. Male or female I could determine with about 90 percent accuracy. It was the goblin part that was new—and confusing. If I didn’t know and could see that Rake was talking to the fire chief, I’d almost swear that he was . . . I shook my head to clear it. The smoke must be getting to me. I didn’t want to risk alerting our mystery goblin, but I needed to get an actual look at this guy. “I’ll be right back,” I murmured. I didn’t stick around to hear the rest. I knew what Kenji was saying and thinking. No, it wasn’t a good idea. It was a bad idea, not to mention risky, but my psychic hook was set, not in the practitioner himself, but in his aura. I had no intention of reeling him in. I was going to take up the line, so to speak, ever so gently, as I went to him. Or at least toward him. All I needed was to get a good look. We had psychic sketch artists at SPI who could take it from there. A quick mind link would be all it’d take for them to see what I’d seen, and voilà, instant mug shot. I crossed the street and moved through the crowd toward Rake, maintaining the most tenuous of psychic contacts with the suspect as I went. I jumped, my concentration broken. It was only Ian, a shout to get my attention, but the spike of adrenaline had done its damage. Psychically speaking, I was standing there as buck naked as the day I’d been born. The goblin’s blow came like a punch to the side of my head, and the next thing I knew, I was falling in a sickening spin as the whole world went sideways, then dark. I awoke to the acute realization that landing on concrete hurts. Ian was picking me up off the sidewalk, so I must have only been out a few seconds. In the sky, the golden northern lights continued to flow and swirl, which did extremely unpleasant things to my head and stomach. I knew what was coming up next, or at least what wanted to. I clenched my jaw, clutched my stomach, and firmly told the contents of my stomach to stay. Ian had been around me long enough to know it, too. He held me up, but made sure my head was facing down and away from him. When nothing happened, I didn’t know whether to be relieved or disappointed. Throwing up would have made me feel infinitely better, but I really didn’t want to do it in public. I dimly wondered if I could make it to the Full Moon’s ladies’ room in time. At least I thought that was what I was thinking. Everything was still kinda whirly. Then I saw something that instantly cleared my head. Across the street, four firemen in those silver fire suits with respirators and air tanks were about to go into the building. I glanced over to where Rake had been standing with the fire chief. Rake’s eyes had gone wide with disbelief, his face pale. Not because of seeing the firemen preparing to go in, but because of what he was now sensing. Oh no. There was someone alive in there. Rake’s expression hardened, his lips narrowed with grim determination. He didn’t need to say “I’m going in.” His expression and stance said it loud and clear. Yelling for Rake to stop wouldn’t work, and it’d only draw attention to what he was about to do. Rake moved quickly, darting behind a firetruck. When he came out, I was the only one who could see him. Rake had cloaked and shielded himself—from view and from the fire—and had run right into that burning building. Ian spat his go-to word for when an already bad situation just went completely and hopelessly sideways. Normally, seeing your boyfriend run into a burning building would be cause for concern, if not panic. He’d once jumped into a swirling pit of molten brimstone to save me, swimming in it as if it was a heated swimming pool, albeit one with a vortex at the center draining straight into Hell itself. The barricades and the police standing in front of them kept me from getting any closer. Ian and I just stood there. It wasn’t like either one of us could run in there after him. Mortals melted, or were at least highly flammable. Rake would come out when he’d done what he’d gone in to do. Minutes that felt like an eternity later, Rake came out with a body over his shoulder. The firefighters were right behind him. Everyone could see him now. Rake had dropped his cloaking spell, but he was still glamoured as a human—as was the man over his shoulder. I could tell he was a goblin. The firefighters had gone in with respirators. Rake had gone in with naked lungs protected by magic, so he had to make a show of being at least mildly affected. Rule number one of being a supernatural trying to blend in with humans—don’t be impervious to things that would kill a mortal. Rake stumbled, going down on one knee, his face twisted in pain. I pushed past the police at the barricade and ran toward him. I dimly heard Ian shouting as he ran interference behind me. Two of the firemen had taken the goblin from Rake and hustled them both over to the EMTs. When I got to him, Rake had an oxygen mask over his mouth and nose and was coughing. One look in his eyes confirmed he wasn’t faking. He was hurt—and he was afraid, not of anything he’d seen, but of what had happened. Or rather, had not happened. I’d only seen that type of fear from Rake once before. He couldn’t talk and tell me, but I knew. His magic had failed. Something or someone had interfered with his magic. I had questions, but I couldn’t ask any of them until we weren’t surrounded by firefighters and the EMTs who didn’t work for SPI, and while Rake was wheezing and hacking his lungs up. He’d had enough magic to glamour himself and the man he’d carried out of the burning building. Glamours were small magic. Keeping the flames from a fully engulfed building from burning both of them to death had taken every last bit of strength Rake had. The goblin was older than Rake, how much older I didn’t know. It was difficult to tell with goblins. He was unconscious, but breathing. Rake lifted the oxygen mask. “Keep us. . .together,” he rasped, indicating the goblin. I knew what he meant. Rake wanted the first face the man saw to be his, preferably his true goblin face, not the human glamour. If I’d been taken from a Renaissance-level world and plopped down in the middle of Manhattan with flashing emergency lights and skyscrapers soaring overhead, the shock would probably kill me. This poor guy needed to at least see a friendly face when he woke up. Fortunately, his clothing was dark and nondescript, so he didn’t look like he’d just come from a Renfaire or costume party. As a seer, I could detect auras. The goblin was a mage of a respectable level. He would have needed that much power to have avoided being burned to a crisp before Rake had gotten him out. An ambulance pulled onto the sidewalk, followed by another less than a minute later. The logos on the sides indicated city ambulances, but I recognized the paramedics. They were from SPI. That meant the ambulances were ours, too. Minutes before, one of the paramedics had been at my party. Calvin had been an army medic in Iraq. He’d added a navy windbreaker to the clothes he’d worn to the party and blended right in. He was helping load the unconscious mage into the ambulance. Since joining SPI, Cal had learned the physiologies of our world’s more common supernatural species. The mage was in good hands. “Go tell Cal his patient’s a goblin,” I told Ian. Ian reluctantly went to deliver the message. I knew he didn’t want to leave me after what’d happened. Rake grabbed my hand and pushed something into it. I only had a moment to glance down at it before Rake folded my fingers closed into a fist. A broken chain attached to a pulsing red stone. “Gethen . . . quick,” he rasped, right before he passed out. I got into the first ambulance with Rake for the short trip to SPI headquarters, where we had a trauma unit that rivaled any New York hospital. When your employees fought monsters and powerful mages and supernatural criminals, their injuries would do more than raise eyebrows at the neighborhood ER. Ms. Sagadraco made sure we had only the best medical care available to us. Before we were even a block away from the fire, my phone came back to life. I did what Rake had asked and called Gethen Nazar. It was a predictably short conversation. Gethen was Rake’s chief of security. Normally, he’d be called a bodyguard, but Rake’s “normal” had jumped out the nearest window when he’d reluctantly accepted the goblin governorship. Besides, bodyguard was singular. Chief of security meant Gethen was in charge of the other unfortunates who had the unenviable job of keeping Rake among the living. But since Rake had been spending the evening at my birthday party within throwing distance of SPI HQ, and had been surrounded by SPI’s best and baddest agents and commandos, Gethen had reluctantly taken the night off at Rake’s insistence. In Gethen’s mind, that had made us responsible for Rake’s safety. In Gethen’s opinion, we had failed in our duty. He hadn’t said that on the phone or even alluded to it, but I got the vibe loud and clear. It was well after midnight, and after talking to Gethen, my birthday fun was over in more ways than one. Rake stirred and opened his eyes. He looked around in a panic and started coughing again. Rake’s body was wracked with a violent fit of coughing that arched his back off the stretcher. With a gasp, his eyes rolled up in his head, as he went limp and still. I squeezed my eyes shut against the sting of tears and nodded. Take your own advice, Mac. Relax and breathe. I gave him the short version. It was all my throbbing head had left me capable of doing. “It’ll only take a second.” Cal flicked the light from one eye to the other. Thankfully, the driver chose that moment to flip off the lights and siren. Then he pushed a button on the console to activate what I called the “these are not the droids you’re looking for” signal. The mages in our Research and Development department had installed them in all our agency vehicles. One of our ambulances could go screaming down a street, and people would actually ignore it—even more than New Yorkers normally ignored such things. The R&D mages had also done some nifty work disguising the five vehicle-accessible entrances into SPI’s underground headquarters. Three looked like the entrances to private parking garages, and the other two were what appeared to be loading docks. Less than half a block later, the gates opened into one of SPI’s fake garages. Dr. Barbara Carey and a trauma team met us at SPI’s subterranean loading dock doors. She was the lady in charge of our medical center. Her word was law. Only when Rake and the mage were in their care did I let go of Rake’s hand. After telling Dr. Carey that Rake needed to be near the mage, I headed toward the waiting room, but Ian and Cal appeared on either side of me, each taking an elbow, and steered me to a treatment bay where one of SPI’s doctors waited by a gurney that right about now looked like the most comfortable thing ever. I relented. A nap sounded really good. Alas, sleep was not to be. Dr. Stephens had deemed me to be concussion free, though he strongly suggested that I get some rest. Gethen Nazar had arrived upstairs and was being escorted down to the medical center. Rake was still unconscious, and I carried a shiny, red rock in my pocket that might shed some light on what had happened to him inside that burning house. Rake had asked me to give it to Gethen. The sooner I did that, the quicker we could start getting some answers. After leaving me in Dr. Stephens’s capable care, Ian went upstairs to the agent bullpen to fight some fires of his own. The recordings from SPI’s neighborhood surveillance cameras needed to be examined for the hours prior to the event and the electricity going out. I’d be going over the same tapes later for any sign of my goblin attacker. Also, our own investigation would need to be coordinated with that of the city police and fire departments. Our allies inside the various city departments would be alerted to ensure the incident appeared to be nothing more than a typical building fire. I had no clue what they were doing about the fact that said building had burned on a lot that’d been vacant for months. The solution to that dilemma was way above my ability and pay grade. Gethen replied with his usual eye roll, directed at his wayward boss, not me. We’d done this dance entirely too many times recently. Rake was gonna do what Rake was gonna do, and he wasn’t about to let anyone stop him. “How is he?” Gethen asked when he got close enough. Gethen looked before he took, and that look told me I probably shouldn’t have let that stone stay in my pocket for a minute, let alone an hour. But I hadn’t had anywhere else to put it, and my thigh didn’t feel like it’d been absorbing evil, so I chalked it up to yet another unavoidable hazard of working for SPI. Like Rake, Gethen was a dark mage. Also like Rake, he hadn’t survived the dangers that went with his chosen career path without developing a finely tuned sense of caution. “So, what is it?” I asked, wiping my hand on my jeans and wondering if there was such a thing as psychic Purell. Gethen’s lips had gone from his usual narrowed in annoyance to vanished without a trace. He quickly hissed a few words in Goblin of what I recognized as a high-powered containment spell, and the red stone stopped pulsing. Yeah, I definitely shouldn’t have shoved that necklace in my pocket. I blamed my poor decision-making on a psychic fist to the head. “You don’t want to know what it is,” Gethen told me. We’d done this dance before, too. Though sparring would be a better description. Gethen was a goblin. While I knew he was simply doing what goblins did, it didn’t make it any less annoying. If you wanted information out of one, you needed to go find yourself a crowbar. I blew out my breath. “You’re doing your job; I’m trying to do mine.” I didn’t say “but you’re not making it easy.” Gethen knew what he was doing and how little I liked it. What I needed to know was why he was doing it. “The pendant is Khrynsani,” he said. “Not much, other than they’re basically the goblin version of Nazis. It seems I need to know more now. Rake’s unconscious.” I gave him a tight smile. “You’re not.” I left the “yet” unspoken. We both knew that as an itty-bitty thing, physically as well as psychically, I couldn’t put a dent in any piece or part of him, but I was tired of getting the runaround, and was just tired, period. “The only one alive. I suspect this particular Khrynsani’s body will be found in the rubble once it cools enough for anyone to get in. Judging from the glow before I applied a stasis spell, this contains said Khrynsani’s soul.” Gethen regarded the slowly spinning stone with a wicked little smile. I really should not have put that thing in my pocket. “What?” I managed. I’d been walking around with a Nazi goblin’s soul in my pocket. It was a good thing I was in the medical center, because I was feeling a wee bit woozy again. “The soul should be securely locked inside,” Gethen assured me. I was placated. For now. Maybe. I was officially beyond words. My skin crawled from my scalp clean down to my toes. Gethen had said I didn’t want to know. Did I believe him? Nooo. “May I see the man he saved from the fire?” I dimly heard Gethen ask. The room looked like one in a hospital’s intensive care unit. There were two beds. Rake was in one, with the goblin mage in the other. Now we were getting somewhere, though not very quickly if I had to keep pulling information out of Gethen piece by piece. “Has he ever been here before?” I asked. I let out a breath I wasn’t aware I’d been holding. Dr. Carey had assured us that Rake would be awake long before Tulis, but I felt better knowing Gethen would be there to keep him from freaking out just in case. SPI’s trauma center was set up to handle almost anything, but that didn’t include an injured and panicked goblin dark mage of Gethen’s level. Predators were most dangerous when they were wounded and felt trapped. His expression clearly said he’d made a mistake leaving Rake alone tonight, and that mistake would not be repeated. Ever. Gethen Nazar had officially gone from being Rake’s bodyguard to Rake’s shadow.